Forecasting encompasses a wide range of meteorological information such as warnings and advisories in addition to forecasts themselves. Its objective is to meet the comprehensive need to protect life and property and to enhance national socio-economic activity in various groups including the general public, industry and the transportation sector. 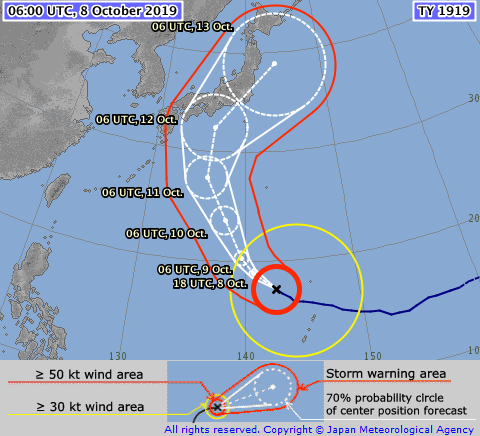 If hazardous weather conditions are expected, the Japan Meteorological Agency (JMA) issues a variety of messages including Emergency Warnings, Warnings, Advisories and Bulletins so that appropriate measures can be taken to mitigate possible disasters. 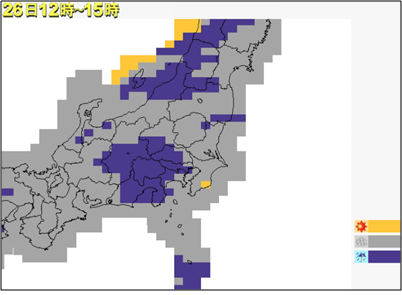 These messages are issued by Local Meteorological Offices (LMOs) to their respective prefectures. Emergency Warnings are issued if there is significant likelihood of catastrophes by a natural phenomenon expected to be of a scale that will far exceed the warning criteria. Warnings are issued if there is a chance of catastrophe by weather conditions that meet relevant warning criteria. Advisories are issued if there is possible development of serious adverse conditions by weather conditions that meet advisory criteria but remain below the warning criteria. Bulletins provide information to supplement Emergency Warnings, Warnings and Advisories. They are also issued by Regional Headquarters (RHs) of JMA or JMA Headquarters according to the scale or severity of the related disturbance, and include information not only on severe weather but also on possible disasters. For example, Landslide Alert Information are issued jointly with municipalities in particular when landslides* caused by heavy rain are expected with a high possibility in the next few hours. Serious damage caused by severe storms including tornadoes in 2006 induced requirements for alerts for hazardous winds. To address this requirement, JMA started to issue the Hazardous Wind Watch from March 2008 based on the discussion in advisory meetings. All such messages are disseminated to the public through administrative organs and wide variety of media. * The term "landslides" here refers to debris flows and concentrated slope failures. Note: The English language section of JMA's website provides information on whether Emergency Warnings, Warnings or Advisories are in effect in particular areas. However, the other Bulletins are shown only in the Japanese language section. Landslide Alert Information (Japanese only) covers debris flows and concentrated slope failures as predicted from rainfall data, and requires responses such as evacuation advisory issuance. The exact time, location and scale of landslides are difficult to predict due to their dependence on local characteristics of vegetation, geological conditions, degrees of weathering and groundwater status. The information does not cover phenomena that are technically difficult to predict such as deep-seated landslides, mountain collapses and landslips. Real-time Landslide Risk Map data supplement Landslide Alert Information. The map shows levels of landslide risk for individual 5-km grid squares on an ascending scale of five risk levels ranging from white to purple. Prediction data used by JMA for risk determination include Soil Water Index values from the period up to two hours ahead in consideration of the time necessary for evacuation. JMA is also responsible for providing flood forecasting services, which are performed in collaboration with central and local government agencies. These services include flood warnings and advisories covering 407 rivers (as of March 2011) throughout the country that have been designated by the aforementioned agencies as potential flood-disaster rivers. Flood forecasting systems for 289 rivers out of 407 are managed jointly by JMA and the Water and Disaster Management Bureau of the Ministry of Land, Infrastructure, Transport and Tourism (MLIT), and 118 jointly by JMA and civil engineering bureaus of prefectural governments. Regular Very Short-range Forecasts of Precipitation are issued twice an hour and Immediate Very Short-range Forecasts of Precipitation are issued every 10 minutes to predict one-hour precipitation over the next six hours with a spatial resolution of 1 km. These forecasts are derived from a combination of Meso-Scale Model (MSM) and Local Forecast Model (LFM) predictions and the extrapolation of Radar/Raingauge-Analyzed Precipitation data from radar observation and calibration based on information from in-situ AMeDAS and rain gauges managed by the Water and Disaster Management Bureau and the Road Bureau of Japan's Ministry of Land, Infrastructure, Transport and Tourism and local governments. Short-range Forecasts up to 15 Hours for Precipitation are issued every hour to predict hourly precipitation from 7 to 15 hours ahead with a spatial resolution of 5 km. These forecasts are derived from a combination of statistically corrected MSM and LFM data. Precipitation Nowcasts provide precipitation intensity forecasting with a spatial resolution of 1 km up to an hour ahead to support disaster mitigation activities in the event of swiftly growing convections. They are issued every 5 minutes within 3 minutes of every 5-minute radar observation. Thunder Nowcasts predict the activity of thunder and lightning strikes up to an hour ahead, and Hazardous Wind Potential Nowcasts predict the probability of tornadoes and other hazardous wind conditions with the same time frame. These two Nowcasts are issued every 10 minutes. Measuring Rainfall — What is Radar/Raingauge-Analyzed Precipitation? Daily forecasts in plain text form for the same day, the next day and the day after are issued three times a day at 0500, 1100 and 1700 Japan Standard Time (JST) for a total of forecast blocks across the country. These daily forecasts contain information about weather, winds, coastal ocean waves, maximum/minimum temperatures and probabilities of precipitation. In addition to forecasts in plain text, JMA also provides versions in graphic form such as Area Distribution Forecasts and Time Sequence Forecasts. Area Distribution Forecasts show the spatial distribution of weather, precipitation and temperature for the whole country with a spatial resolution of 20 km x 20 km. Time Sequence Forecasts predict weather, temperature and wind speed/direction at three-hour intervals for 142 forecast blocks across the country. Both forecasts are issued at the same time as daily forecasts. 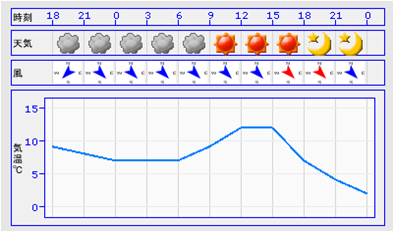 One-week Forecasts cover a seven-day period starting from the day after the forecast is issued. 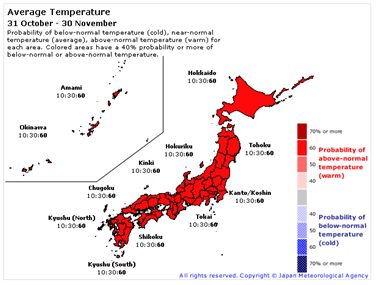 They are put out daily at 1100 and 1700 JST to provide day-to-day predictions of weather, precipitation probability, maximum/minimum temperatures and reliability for prefectural areas of the country. Ensemble prediction techniques are employed as the main basis of the One-week Forecast, and have contributed much to the improvement of its accuracy. In Long-range Forecasts, weather outlooks for the next one to several months are provided. These outlooks offer a prognosis on average temperature, precipitation, sunshine and snowfall in the three categories of above normal, near normal and below normal. Ensemble prediction techniques play an increasingly important role in long-range forecasting. Early Warning Information on Extreme Weather is issued every Monday and Thursday when a high probability (30% or more) of very high or very low seven-day average temperatures is predicted in the week starting from five to eight days ahead of the date of announcement. Five-day track and intensity forecast Tropical cyclones (TCs) can cause serious damage to various countries every year, and accurately predicting their locations and intensities is a vital challenge for JMA. The Agency categorizes TCs as shown in the following table. JMA monitors TC activity in the western North Pacific and the South China Sea, and issues TC advisories every three hours to provide related information including analysis and forecasting of location, intensity and movement up to five days ahead. When a TC moves onshore or is in the vicinity of Japan and is expected to have an impact on the country, analysis is issued every hour in order to advise the public of possible impending disasters. JMA extended the lead time of TC intensity forecasts to five days in 2019 due in large part to the upgraded capability of the new supercomputer system and the introduction of a statistical prediction scheme for TC intensity forecasts. To assist local governments in their disaster prevention activities, information on the three-hourly probability of winds measuring 50 knots or greater is issued when the likelihood is expected to exceed 0.5 percent within five days from each of 375 subdivisions all over the country. For the dissemination of forecasts and warnings, JMA maintains a telephone auto-answering service for the public and direct communication links between meteorological offices and central/local governments as well as the media. The Agency also actively introduces new information technologies into its meteorological information services. 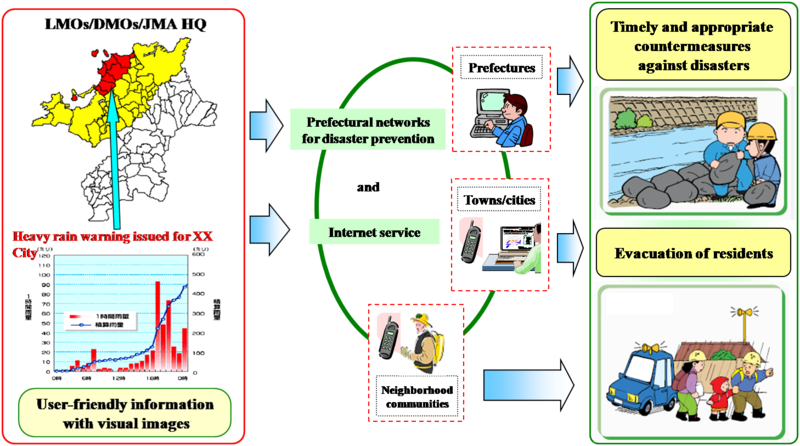 One example of this is the high-speed communications network called the Information Network for Disaster Prevention (INDiP), which enables effective and rapid dissemination of information in both text and graphic form. INDiP connects individual LMOs/RHs with JMA Headquarters to complement the traditionally established communication network for more user-friendly tailored provision of meteorological information - in particular warnings and advisories - directly and individually to disaster prevention authorities in individual prefectures, towns/cities and the media. Information for maritime users is transmitted by the JMA radio facsimile broadcast (JMH) service operated by JMA and fishery radio communications. It is also disseminated within the framework of the Global Maritime Distress and Safety System (GMDSS), i.e. via the NAVTEX broadcast service of the Japan Coast Guard for seas in the vicinity of Japan, and via the SafetyNET broadcast service for ships in the high seas through the maritime satellite INMARSAT. Nowadays, the Internet plays a vital role for JMA in the dissemination of wide-ranging meteorological information not only on forecasts but also on historical and current observational data - including those of other organizations - to the public.